Custom ROMs are all fun, and so is having root access of your device to be able to modify it to your own liking. However, things often go messy, requiring you to restore Galaxy S7 to stock firmware. If you have updated your brand new Samsung Galaxy S7 to a custom ROM or are facing any issues with the latest software updates and want to go back to the stock firmware, here is how to downgrade Galaxy S7 to stock firmware. Once you downgrade Galaxy S7 or S7 edge to the stock firmware, you will also regain warranty and will be able to receive official software updates over the air. Follow this guide for all the steps that you need to follow to restore Galaxy S7 and S7 edge to stock firmware. Downgrading procedure will delete all your data stored in Galaxy S7. Make sure to backup your data and any installed apps. Download and install USB drivers for your Samsung Galaxy S7 or S7 edge in your computer. Charge your device’s battery to at least 80%. Enable USB debugging: go to Settings > About phone. Tap on Build Number several times. Now, you will see a new menu in Settings, named Developer Options. In Developer Options, enable USB Debugging. Important: this tutorial will help you downgrade Galaxy S7 SM-G930F and Verizon Galaxy S7 Edge. You can follow the steps to downgrade any other Samsung Galaxy S7 or S7 edge, but make sure to download the specific stock firmware files for your own device. Do not use these firmware files for a different model of Galaxy S7 or S7 edge. Download Verizon Samsing Galaxy S7 Edge firmware file from here and save it on the desktop. Download Samsung Galaxy S7 G930F from this link. Once you have downloaded the stock firmware file for your own Galaxy S7 or S7 edge from the above links or any other source, here are all the steps that you need to follow to downgrade Galaxy S7 or Galaxy S7 edge. Turn your Galaxy S7 off and wait a few seconds for the shut down process to complete. Now start your phone in download mode: press and hold the Volume Down, Home and Power buttons at the same time, for a few seconds. Next, connect your phone with your computer using a USB cable. When your device is successfully connected with the PC, you will see Added message on Odin. If it fails to show any message, try a different USB port or reinstall the USB drivers on your computer. From Odin, click on the AP / PA and load the stock firmware package. Make sure to check Auto Reboot and F.Reset Time. Click on Start to initiate the downgrade process. When it’s completed, unplug and reboot your Galaxy S7 or S7 edge. That’s it. Your Samsung Galaxy S7 or S7 edge is now running official firmware and is back in warranty. Go to recovery mode by pressing and holding Power, Volume Down and Home buttons. Perform wipe operations: select wipe data factory reset, wipe cache partition and wipe dalvik cache. Close the program on your PC. 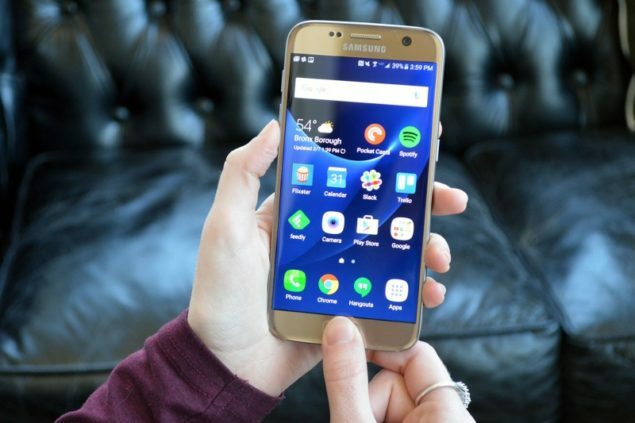 Unplug your smartphone and force restart Galaxy S7. Reinstall USB drivers and repeat the entire downgrade process.